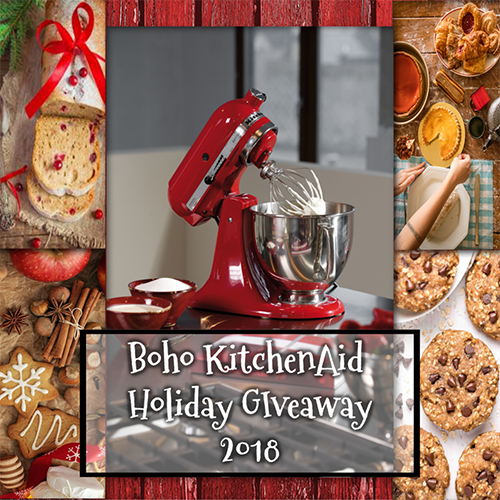 boho, giveaway, holiday, Kitchenaid, mixer, win. Bookmark. I would use this to help my best friend’s baking dreams come true. She loves to cook and bake, but we lack a lot of the kitchen essentials to make the recipies she loves. This would definitely help! i would keep it, i have been wanting one and no one i gift to needs one. I will gift it to me! My granddaughters and I are always cooking up something. Thanks for the chance. What a great giveaway. I’d use this to make just about everything. I’ve need one for a long time now. I would love to keep this for myself. I have been wanting one forever so that I can get my baking ON! As a young student who loves baking and cooking, this mixer would help me so much. I enjoy baking cookies for my friends and family, and a mixer would be so useful in making them. Plus I would be super motivated to learn new recipes, and learn doughs and breads! My mother has a similar mixer in her home, and I am in love with it; I’ve always wanted one of my own, but can’t afford it. I would use this mixer for a lifetime, thanks for the opportunity! I would definitely keep it! I’ve been wanting one for such a very long time, but they are so expensive. I just pine over them every time I go to the store. I would keep this for myself as this has been on Christmas list since last year but unfortunately i didnt get it I have asked hubby for one this year so we shall see. My husband and I love to bake together. This would be so great and helpful when we bake. Thank you so much for the chance! If I win, it will be a very merry Christmas to me. I would definitely give this to my sister as a gift! She has been dying to have one and with 5 kids and only 1 income this would never be possible to have in her life. She is an awesome baker/cook and she would just be so excited! So beautiful. I would definitely keep! I would give it to my nieces so they could make me some wonderful treats. I would either keep it or gift it to my husband because he’s been wanting one for years! But either way it’s going in MY kitchen. Haha. Selfishly I would keep the mixer for myself since I am still using one I received for my bridal shower over 39 years ago! I would keep it. Part Art-part kitchen appliance. I would keep this! We need a new mixer since my old one died on me. I would keep it, I currently only have a hand mixer. I would love this. So I would keep it. I would keep it. I have been wanting one for a long time. I would keep it for myself. I could use a new mixer. Mine is considered ‘vintage’ lol. I would probably keep this one and give a friend my old KA! I have a red Kitchenaid that my niece says she’s taking home with her every time she visits. Would love to win her a brand new one. This mixer would be a great addition vs my hand-mixer and I would be proud to own it! I would keep this mixer! I’ve wanted one forever! Thank you!! An affair from the heart Instagram link isnt working. My beloved mixer just died! I would make homemade marshmallows with this cherry red one! I would keep it, but keep it to gift to my husband for Christmas! Thank you!